Special People on ICE, known as SPICE, is an ice skating community of volunteers and young people with additional needs. 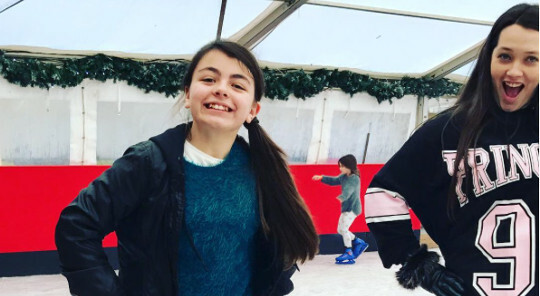 The group thoroughly enjoyed Sunday ice skating sessions throughout December, courtesy of Windsor On Ice! SPICE has been helping to teach children and young adults with conditions such as Autism, Aspergers, Downs Syndrome and Cerebral Palsy to ice skate for over 14 years, as well as supporting their own ice hockey team, the SPICE Jets. Their usual meeting place was Slough ice rink, until it closed at the end of October last year. Having discovered the group’s plight with no new ice rink to go to, Clare Johnson, Operations Manager at Windsor On Ice, organised free ice skating for the group at the rink in Alexander Gardens, every Sunday and during public skating sessions throughout the season. The sessions at Windsor On Ice allowed the SPICE teams to continue their training and practice in preparation for various events at the beginning of 2017, including championships in Nottingham and Cardiff where each team gained a fantastic improvement on their previous scores. “Now that Windsor on Ice has closed, we really wanted to thank you so much for your fantastic support of both SPICE and SPICE Jets ice hockey. We have been able to run SPICE sessions as well as hockey training all through December and keep our group together – SPICE has been running for fourteen years and we are one big family! Not having ice threatened our very existence and your support has helped us more than you might think! It’s a tribute to yourself and your team that our members were so happy coming to Windsor on Ice and most of us prefer the skating and ambiance in favour of the rink at Slough!! “We’re just on our way back from a fantastic event at Nottingham which wouldn’t have been possible without your fantastic support. Team SPICE were simply brilliant! Today we really proved what simple determination, drive and some good friends with an ice rink can achieve! We have our fingers crossed for SPICE that the refurbishment of Slough ice rink starts very soon and wish them the very best for their continued training and enjoyment. Find out more about the ice skating community at spiceskating.org and facebook.com/spiceskating.